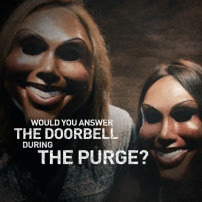 American horror-thriller film "The Purge" is the current number one movie over weekend in the US. The movie which stars Ethan Hawke and Lena Headey has a total of $34 million ticket sales. Total ticket sales though for the week was down to 10% based on last week's ticket sales. Last week's number one movie "Fast & Furious 6" slipped to the number two spot while my favorite movie of the week "Now You See Me" is down one spot to number three. Completing the top five movies of the week are "The Intership" and "Epic" at number four and five. Here are the top 30 movies for the week ending June 9, 2013.
i watch fast and furious, great movie i had fun.. i hope i can watch after earth, i missed ironman 3 eh..
You should skip After Earth. Too much bad review for the movie. Yay! scary indeed. I don't like to watch horror film because i can't sleep if I do. I love watching comedy movie. But i like to watch horror movie as well. you got me curious about The Purge, Makoy! "Because one night a year, all crimes are legal!" - That IS just scary! I really had to dig youtube for the trailer of the purge as it got me curious. Geeezz! scary!